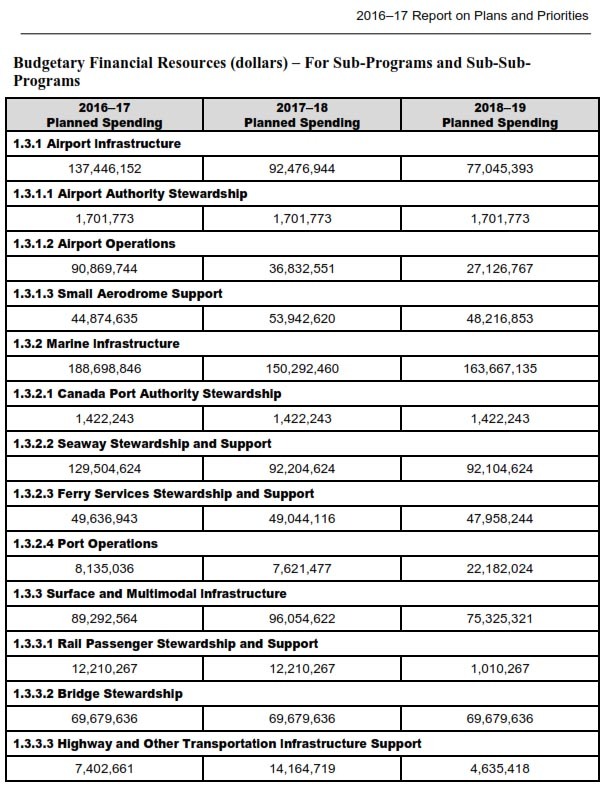 In its statement(s) of plans and priorities for 2016-2020, Transport Canada shows us pretty clearly where it’s priorities lie. 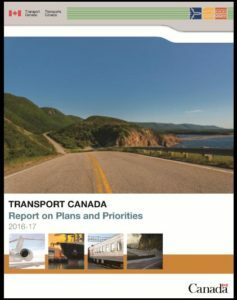 In the introduction of these report(s), Minister Garneau highlights his and his department’s commitment to implementing the “vision” of the “Transportation Act Review”. This review was initiated by the former Conservative government and its agent, David Lee Emerson; it was accepted and is being implemented by the Liberal government. The shoddy review was so narrowly focused on the needs of a handful of business interest, ignoring the large majority of marine industry stakeholders, I find it laughable, if not tragic, that it was even considered as a report, and that Emerson was even paid to produce it. It is certainly quite evident by the projected plans, that Transport Canada has some very good managers and accountants. Or perhaps implementing a few policies to help friends of the government are probably cheaper than producing meaningful well researched and balanced maritime policy, and therefore it is unnecessary to fund the department. In times where my cost and steadily going up in every facet of my family life, Transport Canada has figured out how to cut cost and plans on spending less and less every year on Marine Safety. 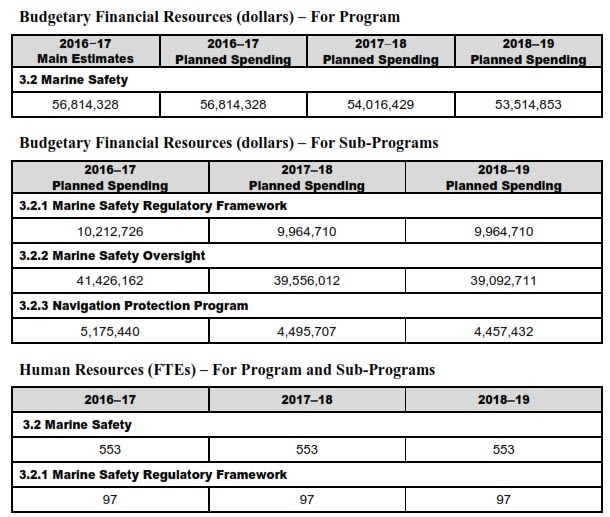 I am not sure which part of the funding of Transport Canada Marine Safety fits in with “World Class Marine Safety” but it would appears that my whole skepticism about the PR campaign is not unwarranted, considering these numbers. In a time where TCMS is currently 6 year behind schedule, and counting, in producing Marine Personnel Regulations to meet STCW2010, we see their budget drop year after year. I am not sure what the magic bullet is that they have, but they should let us in on their secret formulae of keeping the same amount of staff, but cutting their budget – sounds like they are going to attract some top level talent there. 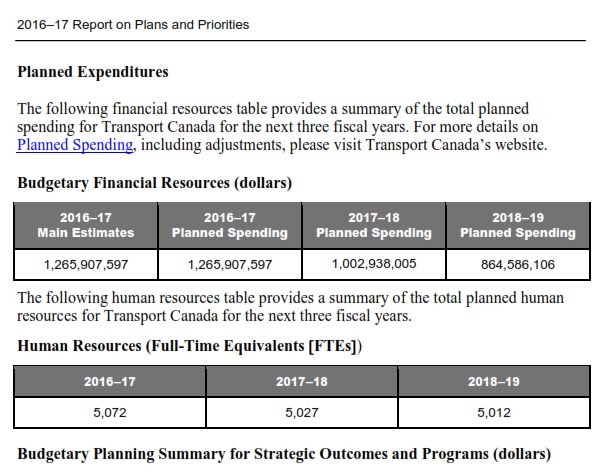 You can find all the “vision” – plans and priorities – statements for Transport Canada on their website, but obviously, they sometimes make it difficult to find, so you can also find them on the Ship’s Library area of the main website. 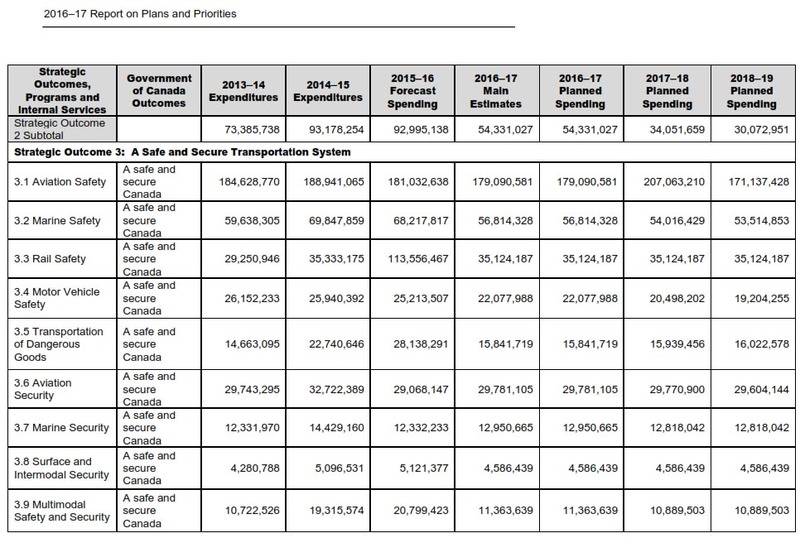 Below, you will some tables, taken directly from Transport Canada literature, that clearly illustrate their priorities. 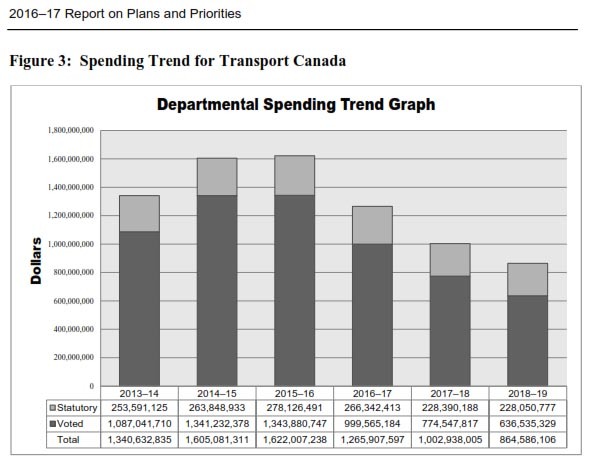 Steady decline in spending projected by Transport Canada, really, are we in that good of shape in Canada? Love this bit, the same amount of people, making less money, or at least that’s how I see it. How is anybody at TCMS suppose to feel good about their job reading this, and how will the industry be well served by it?